We are very happy to announce that the Christopher and Dana Reeve Foundation has recently awarded SSD a grant of nearly $10,000. This donation will fund two future litters of service dogs, covering veterinary tests and care, whelping supplies and socialization. The Christopher and Dana Reeve Foundation is a nonprofit organization dedicated to improving the quality of life for people living with paralysis. The Reeve Foundation does a lot to promote the health and well-being of individuals who have mobility challenges, a spinal cord injury and paralysis. They have a wealth of comprehensive information and resources, as well as referral services, and they also conduct extensive research in search of a cure. Service dogs can provide assistance to support people with paralysis, spinal cord injuries and mobility issues to become more independent. These dogs can pick up dropped items, pull doors open, turn light switches on and off, pull a wheelchair, and find and retrieve the phone, among many other things. When they’re born, the puppies in these two litters will have an important job to do. Someday, they’ll walk patiently by their partner’s side, ready to do whatever is required of them. They may become a dog like SSD Dylan, who has learned to pull his partner’s wheelchair and open doors. They may become like SSD Cabo, who assists his partner to balance as she walks. Or perhaps they’ll become like SSD Misty, who retrieves almost anything for her partner. 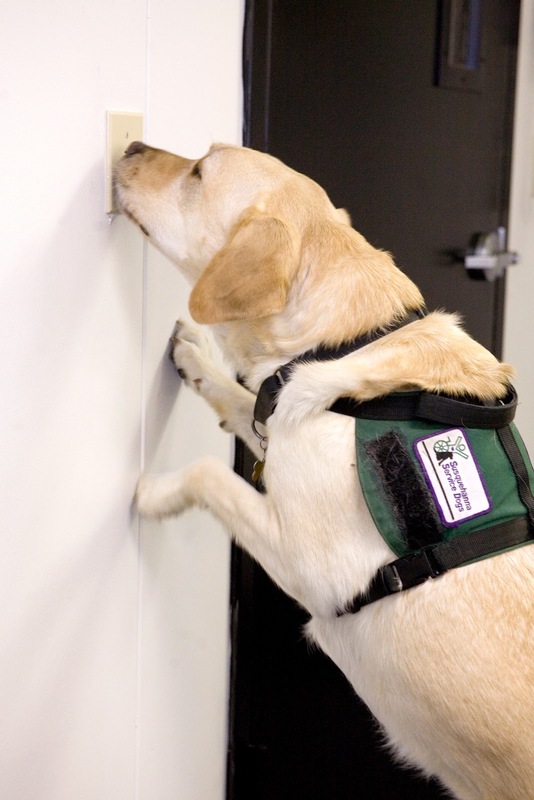 No matter what task they perform, these dogs will change lives. Thank you to the Christopher and Dana Reeve Foundation! It's not the Globe Theatre, but the Shakespearean puppies are still center stage. They're now live on the puppy cam! Watch them as they eat, sleep, play and take their first steps as service dogs in training. SSD Bill Shakespeare is named after one of our long-time volunteers, Bill Hahn. Bill passed away in May. He and his wife, Sue, have raised several puppies for us. He will be greatly missed. 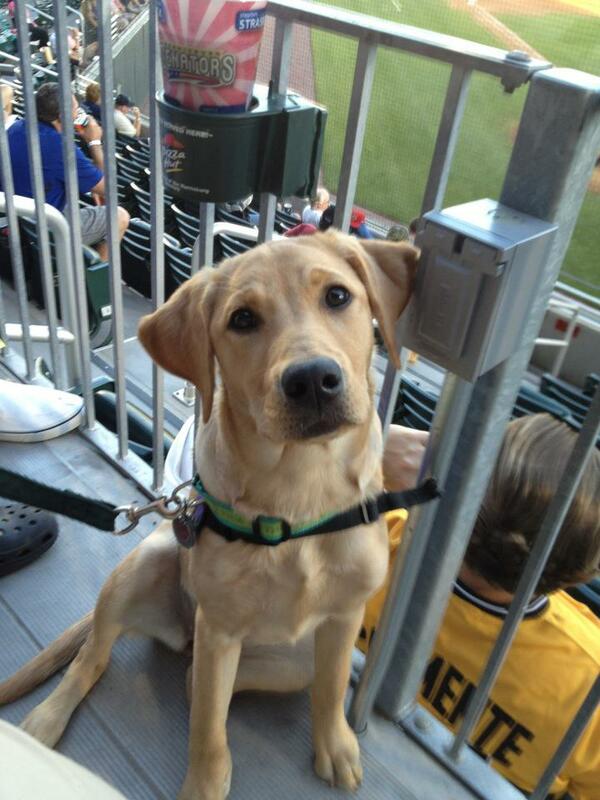 We hope you enjoy the puppy cam! 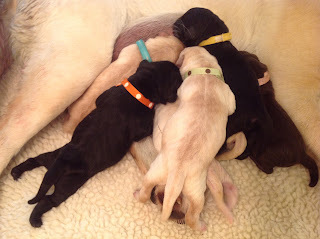 Just like Shakespeare’s comedies, the birth of Midge’s puppies was full of surprises. Midge started nesting and panting – some of the signs of labor – in the early afternoon on June 12. 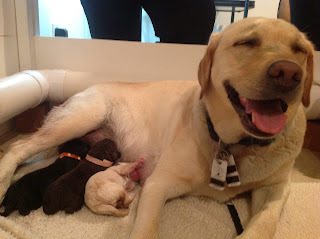 She delivered a black male, followed by a yellow female, but when the third puppy appeared, we were in for a surprise. The third puppy was a chocolate female! Midge soon delivered two more puppies like a pro. 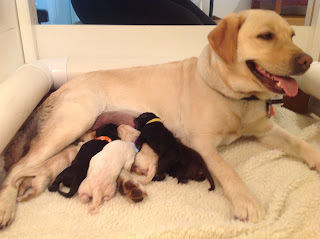 Since her ultrasound had revealed five puppies, and Midge has been pretty consistent with her litter size, we thought she might be done, even though she still looked pretty big. We always stick around for a few hours, though, just to make sure, and sure enough, another puppy appeared! Half an hour later, the last puppy, a yellow male, made his appearance, although he was more white than yellow. These are the kinds of happy surprises that we like to see in a whelping! Midge and her seven puppies are doing great. When the puppies are several weeks older, one of them will be joining its father at the Guide Dog Foundation for the Blind. 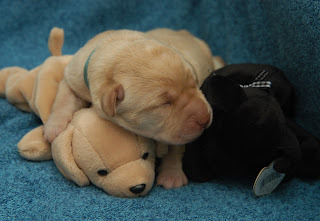 We will be setting up the puppy cam next week, so you can start watching these adorable puppies. You will also be able to hug these puppies! Puppy hugging will start when the pups are 4-5 weeks old. If you’re interested, sign up online to be a puppy hugger! Tuesday was a big day for our new service dog teams in training. They went on their first public outing! For this first outing, we went to the Harrisburg Mall. The mall is a great place for the teams to practice their skills. 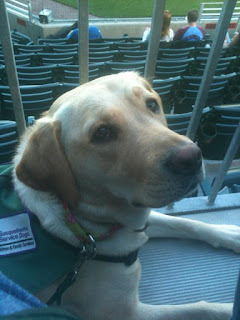 It gave each person the chance to practice for the public access test that all of our service dog teams must take. They also practiced some of the tasks that each dog was specifically trained to perform for their partner. SSD Dylan worked on opening doors for his partner. To begin, he started by pushing the button to open the doors. Watch as he uses his nose to push it. Because not all doors are accessible, Dylan has also been trained to use a pull strap to open a door. Watch as his partner works with him to have him pull the door open for her. Dylan has also been trained to pull his partner’s wheelchair. Look at them go! The great thing about practicing in the mall is that our teams are working in real-life situations. Here, SSD Jagger and his partner walk into a store to do some shopping. They were also working on loose leash walking. Jagger is a balance dog, so it’s important for him to stay right by his partner’s side so he can act as a counter balance. Look at how nicely he stays by his partner’s side. 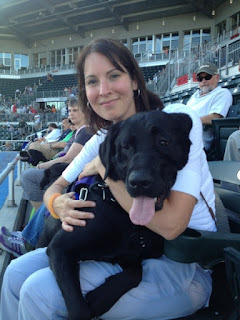 Both of our partners and their dogs did very well on their first public outing! Last Thursday was one of the biggest days in Team Training. Each partner took their dog home for the first time. It was the longest any of them had spent with their dog. They had a chance to bond and start to learn each other’s habits. For example, SSD Dylan’s partner learned that Dylan snores at night – loudly. But Dylan also stuck by her side throughout the evening and the next morning. He knew exactly where he was supposed to be. SSD Zappa and his partner went for a long walk together and played in the yard. SSD Jagger’s partner put him to work – Jagger pushed drawers closed on cue. He also picked things up off the floor for her, even when she didn’t ask him to do it. At one point, they were outside, and Jagger saw a bunny. His head came up as he stared at it, but his partner told him to leave it, and he immediately turned and looked at her. The first night was a happy success! Today, we went over grooming. We mostly train labs because they need minimal grooming, but that doesn’t mean there’s no care involved. Labs shed, and we give all of our partners three different types of combs and brushes to manage all of that fur. The dogs also need to have their teeth brushed, their ears cleaned and their nails trimmed. Since each team has different cues they need to work on, we split into small groups so each team could practice their cues. SSD Dylan and his partner worked on turning on the light switch. In the video, Dylan uses his nose to flip on the light switch and his teeth to turn it off. And he does all of this while standing on his hind legs. SSD Falcon and his partner practiced getting in and out of the car. Falcon will ride in the back of the family’s van, so he practiced hopping in the trunk on cue. Falcon’s puppy raiser had given his new partner his blanket for the van, so when Falcon hopped in, he felt right at home. SSD Zappa and his partner spent time working on shaping. Each partner chose a trick they wanted their dog to learn, which is a great way for both dog and partner to practice clicker training and shaping. Zappa’s partner decided that he wanted to teach Zappa to go through a hula hoop. He started by clicking Zappa for looking at the hoop and then for moving closer to the hoop. It’s a longer video, but look at how much progress Zappa has made by the end of the training session! We have no doubt that he’ll be walking right through that hoop by the end of team training. Yesterday, we welcomed seven new puppies into the world! 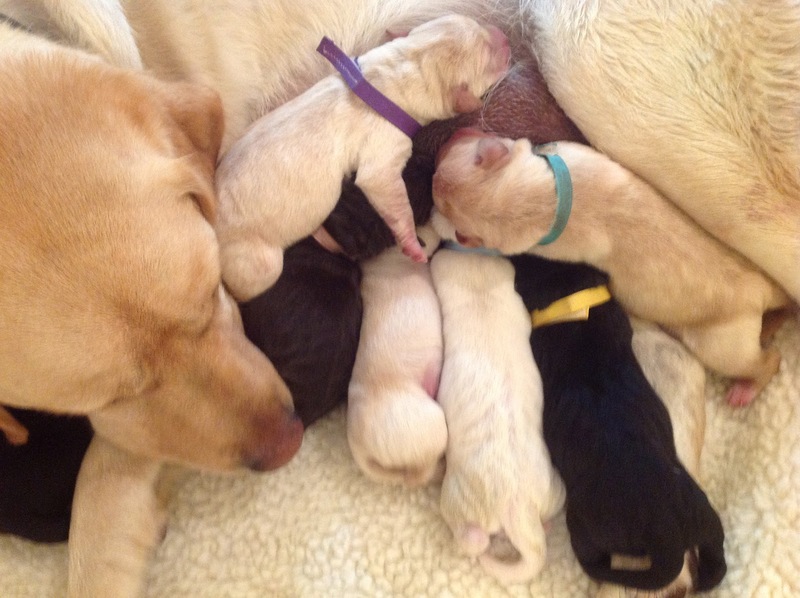 SSD Midge gave birth to one black male, one yellow female, one chocolate female, three yellow males and one black female. Mom and pups are all doing fine. We'll share more about their birth later, when our whelping team has a chance to catch their breath. Right now, though, we could use your help naming them! The theme is Shakespeare, and we need both male and female names. Please leave your suggestions in the comments. Friends, Romans, countrymen, lend me your ears! 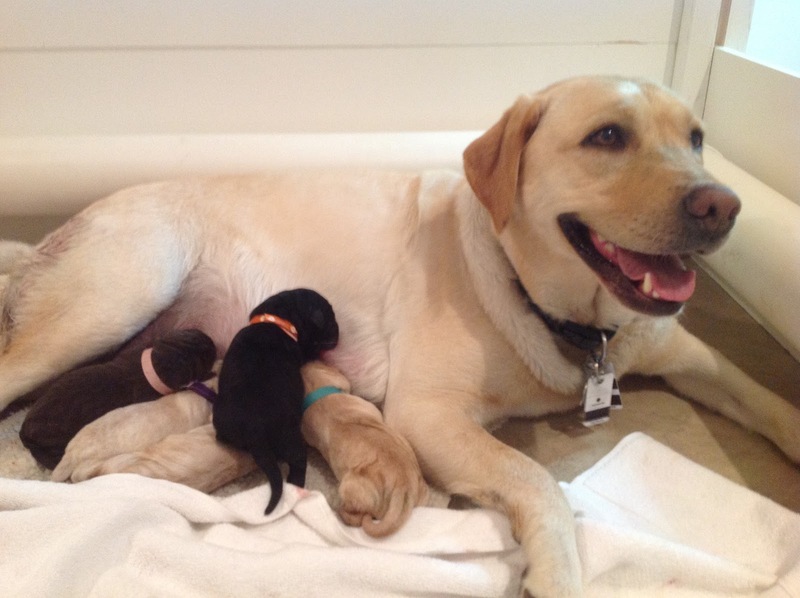 SSD Midge is due to give birth any day now, and her puppies all need names. But what’s in a name? That which we call a rose, by any other name would smell as sweet. A name may be just a word, but it’s an important word, especially for these puppies. Their names will let them know when someone is trying to get their attention so that they can learn all of the skills to become service dogs. One day, these puppies will be constant as the northern star and stay by their partners’ sides, assisting them in daily tasks so that they can be more independent. These puppies will change lives. And so, without further ado, here is the theme for Midge’s puppies: Shakespeare! Will you help us name the puppies? We need both male and female names, and all of them must have something to do with Shakespeare. Please leave your suggestions in the comments. And now, let the names come trippingly on the tongue! Do You Know the Signs of Heat Stroke? Whew! It’s getting hot out there! While we love the warm weather and doing all sorts of fun things outside with our dogs, this heat can be very dangerous. As humans, we can sweat to cool down. Dogs only sweat a little bit through their paws. Instead, they use panting to cool off. 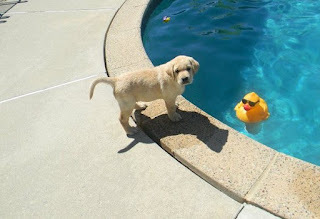 But in the heat, dogs can quickly overheat and succumb to heat exhaustion or heat stroke. Do you know the signs of heat stroke? It could save your dog’s life. If your dog is exhibiting any of these signs, you need to start cooling him down immediately. Move out of the heat and the sun. Shade can help, but if possible, try to get inside to an air conditioned room. Use cool towels or cool water to help your dog’s body temperature drop. This will work best if you soak towels in cool water and place them on your dog’s stomach, groin and armpits. You can also cool his paws down. Do not use icy cold water or feed your dog ice cubes to cool him down. This could cause him to cool down too fast and can actually make the situation worse. Even after your dog seems to be cooled down, take him to the vet, especially if he was exhibiting any of the more severe symptoms. Heat stroke is preventable. Avoid the hottest part of the day, and don’t allow your dog to overexert himself in the heat, even if he looks like he’s having a great time playing. Always make sure your dog has access to plenty of shade and cool, fresh water. And never leave your dog unattended in the car, no matter how long you think you’ll be gone. For more summer tips, check out our 6 safety tips to enjoy summer with your dog. SSD Gideon threw out the first pitch at the Harrisburg Senators game on June 6. He put it right in the catcher’s glove! 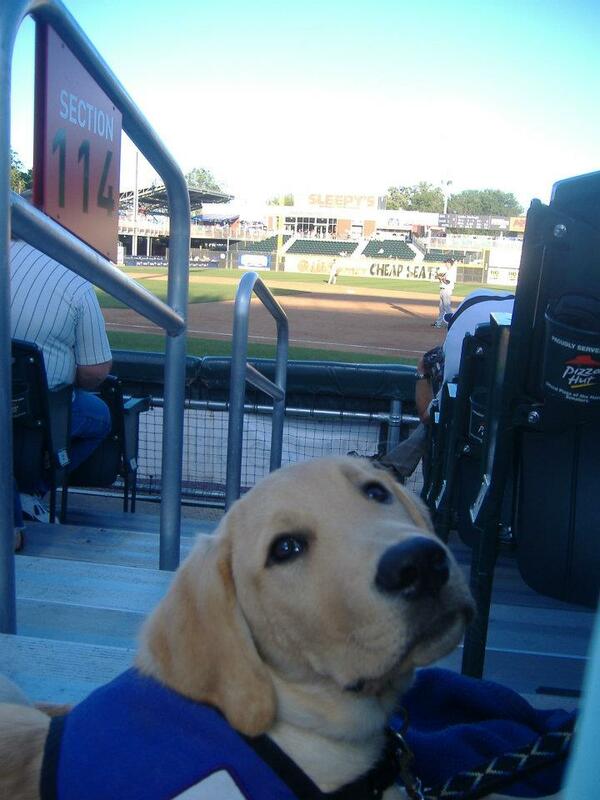 Watch this black lab put the ball right over the plate. SSD was the community organization of the game, and lots of our puppy raisers and dog in training came out to cheer on the Senators. And they won!